Asphalt Drum Mix Plant Manufacturer India. – Page 2 – MEWAD ROAD EQUIPMENTS We are Leading Road Equipment Company in Ahmedabad. We are leading manufacturer of Asphalt Drum Mix plants widely known for its high production and quality. The Drum mix plants we manufacture and exports, guarantees our customers with trouble free operation. Our drum mix plant is known for powerful presentation and easy function. These drum plants are presented in wide-ranging capacity and can even be customized as per requirements of valued clients. We are counted as one of the chief drum mix plant suppliers from India. * Convenient maintenance and repair. In Modern Drum Mix, we use latest technology is used to produce the highest quality hot Asphalt mixture to perform trouble-free task. The coating action of drum mix plant, produces uniform high quality hot mixture with equipment that has few wearing parts and require less maintenance. Fully Insulated Bitumen Storage Exporter & Heating Tanks are available with various capacity models. These Bitumen Tank is fabricated from steel plates with 50 mm glass wool insulation, manhole, thermocouples, etc. Bitumen is pumped to the dryer drum through pipe lines. These tanks are fitted with independent on-off type burners. Sufficient thickness of Insulation & Advanced Oil Burner saves the valuable Fuel for Heating of the Bitumen. A single-deck vibrating screen is used into the single conveyor to remove oversize aggregate received from the Raw Material coming from the Four Bin Feeder. Our Company is the prominent manufacturer of an inclined Slinger Conveyor in India. These conveyors are aggregate from the gathering conveyor and feeds it to the dryer. Slinger Conveyor is provided to transfer the screened raw material from Four Bin Feeder to the therm of the Drum. Load Cell is also fitted on this conveyor to weigh the material being transferred. These Load out conveyor helps in feeding the mixed aggregate into tippers. These mixed aggregates is discharged from dryer drum on these inclined conveyor provided with hydraulic hopper at delivery end. A fully Automatic control panel with further touch controls is provided to control the quality and quantity of production. These control cabins have operator sitting in Air-conditioned comfort. 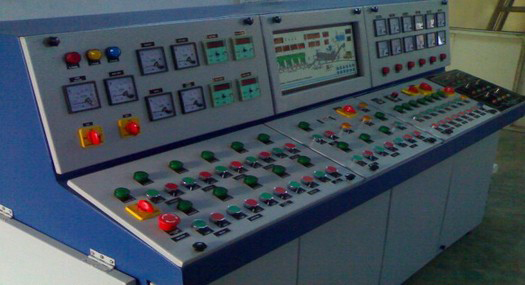 All systems are complet ely synchronized with automatic / manual control of burners, load cells, mix temperature, cold feed / mineral / bitumen proportions, etc. Manual control is possible through over-ride system. All the safety measures are adopted to avoid overloading and short-circuit.